How did the Galileo mission end? 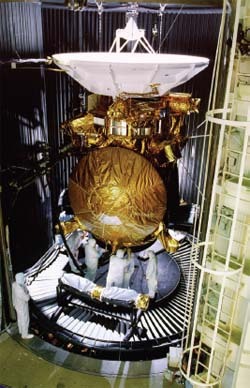 After all its challenges and difficulties, the Galileo spacecraft was still working fine, with the exception of the failure of its high-gain antenna. By 2003 it had very nearly used up its propellant. Rather than letting Galileo travel in an uncontrolled way, and possibly crash into one of Jupiter’s moons by accident, NASA flight controllers decided to end the mission by flying the spacecraft intentionally into Jupiter’s atmosphere. So, on September 21, 2003, scientists took one final chance to study the largest planet in our solar system. As Galileo went down into the atmosphere and burned up, its instruments recorded the atmospheric and magnetospheric conditions of Jupiter closer-up and more precisely than any previous measurements ever had.